Overscaled and underwhelming, Sam Raimi’s Oz the Great and Powerful traffics in big bucks, big bangs, and small ideas. Unlike recent eye-popping spectacles like James Cameron’s Avatar or Martin Scorsese’s Hugo, the simplistic, emotionally empty origin story is neither magical nor dreamlike. Oz has no brains, no heart, no courage and, perhaps even sadder, no imagination. 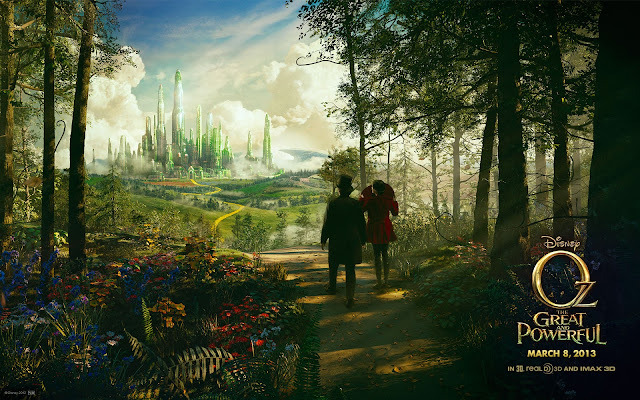 The film, written by Mitchel Kapner and David Lindsay-Abaire, hews faithfully close to its flashy forbearer, Victor Fleming’s lavish The Wizard of Oz, but the comparison is not in Raimi’s favor. For all of the director’s energy and exuberance, the frenzied marketing and promotion of the movie are more enthusiastic and original that its clichéd plot, and one might suspect more thoughtful as well. The film repeats all the mistakes of Disney’s Alice in Wonderland, only does so without the redeeming qualities of Johnny Depp or Tim Burton. Oscar Diggs, or Oz (James Franco), is a small-time magician and big-time womanizer with serious commitment issues. The handsome, self-serving, fast-talking illusionist is charming enough we’re almost willing to let him get away with his cheap tricks, but not quite. 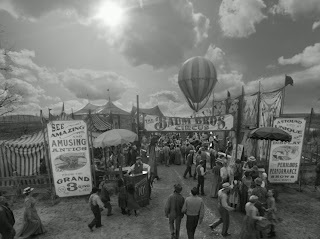 As Oz opens, in an extended sequence of windy, dusty Kansas filmed in black and white on an almost square screen which acts as a tribute to the 1939 film, Oscar is working for a traveling circus, but seems more interested in his assistants than his act. Fleeing an angry strongman—whose wife he prestidigitated into his bed—he hops into a hot air balloon, getting caught in a tornado that lands him safely in Oz. Theodora (Mila Kunis), a gentle, naïve witch tells the charismatic conman about the prophecy anticipating his arrival to rule Oz, and immediately proceeds to fall in love with him. Her older sister Evanora (an icily beautiful Rachel Weisz) has altogether other plans for the wizard. On his side, the hero has a flying monkey called Finley (voiced by Zach Braff), a beautiful, delicate, somewhat creepy china doll (Joey King), and the good witch Glinda (a luminous Michelle Williams). The characters wear out their welcome, however, and the jokey banter and crowd-pleasing quips are not nearly as witty as the filmmaker would like to believe. At first the vivid, vibrant visuals and the way the scene changes almost imperceptively from monochrome to color is enough to hold our attention, but after a while the hues seem garish and overdone, like a Technicolor experiment gotten way out of hand, as pinks, reds, yellows and oranges collide, combine and clash mercilessly. 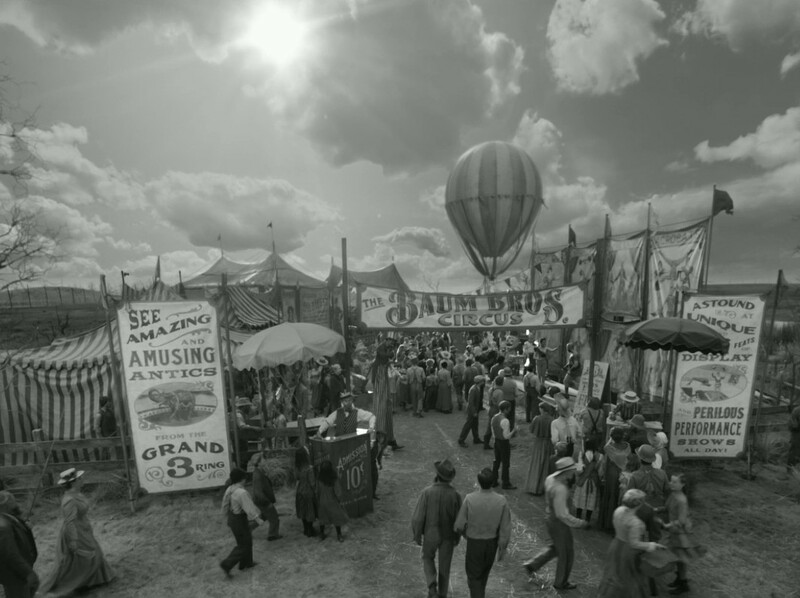 The studio backlots of the classic Wizard of Oz were perhaps no more real than the digital wizardry and technological illusion that goes into Oz the Great and Powerful, but they were enough to make it look like a live-action film instead of an artificial, colorful cartoon. For all its outdated, low-tech flamboyance, the older film was richer and more fun. At their simplest, movies are still sometimes the most magical. Oscar basically takes on the role of Dorothy as an outsider embarking on a quest of self-discovery, aided by new friends and old companions—or technically both, since the supporting cast pops up, as it had in the original film, on both sides of the rainbow. Franco at times seems uneasy, perhaps recognizing the idiocy of the dialogue, perhaps uncomfortable working against a green screen with an imaginary flying monkey in a bellhop outfit, perhaps wondering why Johnny Depp gets all the Tim Burton films and how he pulls off this kind of roles. Raimi has never met a flying, jumping, squirting, falling object he didn’t like—especially if it’s in the direction of the screen’s three dimensions—but he’s not sure what to do with people while they’re standing or sitting still. Oz values special effects and spectacle over storytelling. It’s supposed to sweep you up into its fantastical world of witches and wonder, munchkins and mystery. For certain isolated moments of haunting beauty, the movie succeeds in transporting viewers to a land filled with psychedelically colored flowers, blossoms that turn out to be butterflies and birds hued to an almost radioactive intensity, but we are swept up in flights of fancy, not feeling. The final act is not without its surprises and delights, as Oscar, relying on the scientific wizardry of men like Thomas Edison, demonstrates that pluck, luck, and a few firecrackers can be magic enough if people believe in them. The problem is we never quite believe in Raimi’s film. His Oz is neither great nor powerful; by the end we regret we’re not in Kansas anymore.